●Not necessary to rub or polish. Just wash with tap water afar removing rust. ●You can brush or spray on the RSR-2 for big objective. ●Use gloves when handling RSR-2; it may infiltrate skin with wounds. 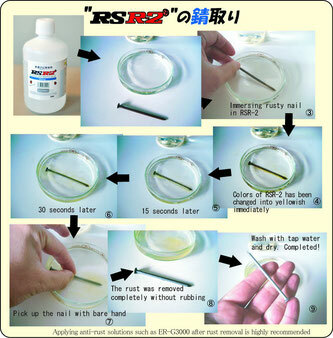 ●You can dilute RSR-2 with water and dispose of the solution in a drain after use. ◆It may take a few hours to get rid of rust, depending on grade of rust. ◆RSR-2 is a strong acid, originally pH1. Hence it will be necessary to neutralize the liquid first if it is still effective and especially if it has to be disposed of in a large quantity. ★RSR-2 may melt soft vinyl and nylon stocking upon contact. ★RSR-2 may slightly melt containers made of materials such as aluminum, tin and zinc due to its restraining effect. ★Stainless steel might be discolored. As such, it is necessary to find the suitable dilution rate before use. Carefully read the directions label before use. ★Ensure sufficient ventilation when using this product. Avoid strictly on using this product in an enclosed room. ★Direct contact of product may melt soft vinyl and nylon type stockings. ※Product may weakly melt container material such as aluminum, tin and zinc due to its restraining effect. ★Please take note that product may cause pain if there is cut on hands. ★Wash hands, clothing and tools used in the handling immediately with plenty of water after handling of product. ★Please wear rubber gloves, eye protective goggles and mask when handling product with strong acid. ★In case this product was ingested, drink 1 ~ 1.5 liter of water or approximately 1 liter of milk and get medical attention immediately. ★After using of product, wash with plenty of water. ★This product is a rust-removing agent. It has no anti-rust preventing. An anti-rust agent is recommended. ★There may be slight discoloration on stainless steels due to its material difference. Please use the product after performing a dilution percentage test beforehand. ★When using the product for soaking, please use container made of FRP, PVC or wood. Avoid metal container. ★When disposing of its waste, neutralize its pH with lime or bicarbonate soda to pH 6.8 ~ 7 before flushing it down. ★When there is a possibility that rust may develop between metal part and surface coating of paint or plating, please do not use the product as it may peel off the surface coating of paint or plating. ★When removing the rust, gas or odor stench may be generated. Ensure sufficient ventilation. ★When RSR-2 is soaked onto a cloth and rubbed on metal or plating, discoloration may occur. Instead of rubbing, use the product using brush spray-painting method. ★If there is fear for discoloration, carry out a patch test at an obscure area for a long period of time (it may discolor according to time) before using the product. ★If RSR-2 is left in an easy to volatilize situation (such as when transferring to other container, leaving the cap open etc. ), its volatile gas may oxidize metals. Therefore, do not place materials that are easy to be oxidized at its surrounding. ★This product is especially for rust removal on iron parts. Do not use this product on items such as precious metals, gems, antiques, and work of arts, expensive gold products or invaluable products. ★Depending on the level of rust condition, rust removal may need to be done for more than a few hours. ★If there is oily layer, remove the oil first before applying the product. ★This product will melt zinc plating, tin plating and aluminum plating etc. ★This product may also melt and discolor low quality chrome plating and nickel plating. Carry out patch test on obscure area for a long period of time before using this product. If patch test cannot be done, please refrain from using the product. ★When removing rust on plating, do not leave it on but instead wash it immediately with plenty of water as it may discolor or develop further rust if not washed immediately. Close its cover tightly when storing. Avoid storage under direct sunlight. for the rust to be removed.